Keep up with the lastest news by subscribing to our email newsletter, or following us on any of our social media sites (on the side of our website). Welcome! I hope you've enjoyed looking around our site. I'm Celine and although I loved The Mortal Instruments instantly, I didn't start TMICanada until a couple years later (in 2012). I've read all of Cassandra Clare's other series (i.e. The Infernal Devices, The Bane Chronicles, etc.). In general, I'm a big fan of supernatural/magic/paranormal books. I feel like they're an escape from reality. So if you ever want to check out my list of books or fangirl about books, you can add me on goodreads. My name is Olivia and I am one of the new writers for the TMICanada blog. I am 19 years old and currently in university to become a nurse. I fell in love with The Mortal Instruments the moment I first read them. All the other series (TID, TBC) were just the icing on top of my fangirl cake. Anyways, I look forward to share all the news of the TMI fandom and share with you some of my personal opinions on Cassandra Clare's best selling novel. My name is Michaela and I have been into the Mortal Instruments for 2 years. I was looking for something new to read and came across it at Costco one day. Being a hug Harry Potter fan, I read the back and it said Harry Potter fans will love it. I purchased it and quickly fell in love with the Shadowhunter world. I will be attending collage this fall, first year. I took a small course this year on Wed design and HTML. (Still working on learning the coding) Once I do learn the HTML coding I could very well help make the site pretty. This year I've been learning to play the acoustic guitar. I love reading and enjoy video games as I own a Nintendo Wii. I try to stay active as much as I can. TMICanada has no affiliation to Simon & Schuster, Sony Pictures, Screen Jems, Unique Features or Cassandra Clare. 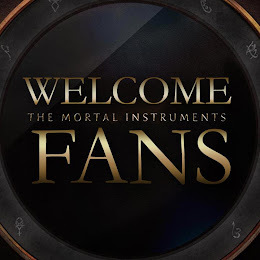 We run this site out of devotion and admiration to Cassandra Clare's Shadowhunter world. We do not claim copyright to any of the pictures or videos shown on this website unless otherwise noted.